Jennifer Haigh has done it again for me, folks. Baker Towers may have been released six years prior to Faith, but it successfully continues the fascination I have for her work. Baker Towers was everything I wanted, and so much more. This blue-collar family saga beginning in the 1940s in a coal-mining town in Pennsylvania was absolutely magnificent. It is a genuine look into the lives of young men and women who helped set another block into the foundation of America and made history. Bakerton, Pennsylvania is made up of residents who are Swedish, Polish, and Italian immigrants, with the coal mine employing a good majority. In the Novak family, the home is traditional to the time and place. Rose and Stanley, first-generations to America, live in Polish Hill in company-owned housing. Rose, an Italian wife and mother, remains at home to take care of their five children, and her Polish husband, Stanley, works every day in the coal mine. It was never expected that he, provider of the family and gentle disciplinarian, would suffer a fatal heart attack leaving too early his wife and five children to make a place for themselves in a town and in a world that is rapidly changing. This is the story of the five children who would be members of the Greatest Generation, living in a town whose existence thrives off the hulking mass of coal mined daily from deep in the mountain, resulting in Black Lung for miners and making widows of their wives. Each of the Novak children must find their way through life and whether it's enlisting in the military, or moving to Washington, D.C. and working for the government, or running away with no other goal but to just leave Bakerton, and who cares where you end up, their lives are ultimately filled with family, loss, love, and regrets, and it is a beautiful story with sincere contemplation on the painful choices each of them make. Combined with a glimpse into what life may have been like for those who lived during this time, ignoring the expected vintage nostalgia but instead strongly imbuing the story with remarkable authenticity, Baker Towers captures America during a time that will never be forgotten. The Novaks grow up, marry, and live their lives, and although some escape small-town life, over time they find that their paths invariably meander around and back to the very place that once made them want to flee. This was impossible to put down, the story weaving between characters and historical events with an efficiency and skill that captured me from the very first page. Quite frankly, it swallowed me up in the time and even made me feel the aesthetics and intangibles; I could see and feel the outfits the characters wore, the jobs they took, and the cars they drove. I also could easily see this as a movie, and with all of HBO's recent endeavors into successful adaptations to the small screen, I think it would follow up quite nicely after their expert remake of Mildred Pierce this past summer, starring Kate Winslet. Jennifer Haigh is just brilliant with her storytelling, and I decided that she is now one of my favorite authors. Her writing is expressive, moving, and thoughtful, and she has an astounding way to take tough subjects and events and turn them into the most painfully memorable moments of reading that I've had in the past year. I've enjoyed it all and can't wait to read Mrs. Kimble and The Condition next. In the interview with the author at the end of the book, it wasn't surprising to find that the small tidbits that made the story feel so authentic to the time, came from reading old magazines and noting advertisements of popular products and places. It made me a bit wistful for a hobby I have, so I picked up a few magazines from the 1940s on Saturday. I must admit, you can get lost in reading Life magazine, and over the weekend, I read a few editions from 1943. One issue included pictures from the celebrated photographer Margaret Bourke-White and her series of women in the steel mills. It was definitely a pleasure to read what the country was experiencing at the time, and I wanted to pick up Baker Towers right away and read it all over again. While I can't predict what 2012 will hold for me with all of the amazing books I hope I'll be reading, I brazenly will propose that Baker Towers will more than likely be in my list of favorite books read this year. Without question, this is my favorite for January 2012. I loved this book and promise that if you enjoy historical fiction, family sagas, the Greatest Generation, and especially if you love Jennifer Haigh's writing, you will more than likely love this book as well. If I missed your review, let me know so I can link to you here. 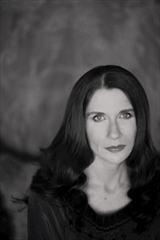 Jennifer Haigh is the author of the New York Times bestseller Baker Towers, winner of the 2006 PEN/L.L. Winship Award for outstanding book by a New England author; Mrs. Kimble, which won the PEN/Hemingway Award for debut fiction and was also a finalist for the Book Sense Book of the Year; and The Condition. Many thanks to TLC Book Tours. In celebration of the release of Faith in paperback, all of Jennifer Haigh's books are on tour through February 2012. To read all of the reviews at each tour stop, click here. I hadn't heard of this book before, but based on your recommendation, I added it to my wish list. It sounds just like what I like. I hope you like it! Jennifer Haigh is just brilliant and I cannot wait to read her other books! I loved your review of this book, Natalie. This is an author that I'm looking forward to reading this year. Sounds like are her books are worthwhile to pick up. Thanks, Kay! The story swept me up into it all and I couldn't put it down. Faith was another book that that I couldn't put down, so I think either book will be a good choice. Let me know what you think if you read either that or Baker Towers! I read Faith as well as this one. Both were good. I'm lookimng forward to reading her other books. I'm thinking I might do an audio version. The audio version of Faith was incredible, but I did enjoy reading Baker Towers...decisions, decisions! I read Baker Towers a few years before I started my book blog. I really liked it! That's the tough part, when you've read books before the blog started, isn't it? I want to revisit all of those books again that I loved. And Baker Towers is such a fabulous story, I envision that this one will definitely be a re-read, and sometime soon! I love your review too. I haven't read anything by her yet - obviously something I should change! I highly recommend Faith and Baker Towers, I think you and your husband would love both of them! I keep seeing more and more reviews of her stuff! I really need to hurry up and read something (anything!) by Haigh. Faith and Baker Towers were wonderful; can't wait to see what you think of them! Oh wow! This is strong praise indeed! I have Faith sitting here and staring at me right now, and it seems as if I need to get to it as soon as I can. Haigh sounds like an amazing author! Fantastic and utterly enticing review today, Natalie! Heather...you need to pick up Faith! Such an incredible story. I listened to the audio version and loved that as well. I hope you enjoy it! YES, to everything you said. My review comes on Wednesday and I think we'll be in agreement! I just read your review, Audra. We are definitely in agreement! It's so nice to be able to find others online who feel the same way about favorite books and authors! HOW I have not yet read one of her books I don't know because I keep hearing how amazing she is and I had at least a couple of her back list on my wish list at some time or another. Fortunately I'm reading Faith soon (maybe starting today) for upcoming blog tour and I'm super excited!! I cannot wait to read your thoughts on Faith. It's an incredible story and was so fairly told from all perspectives. I can't wait to read more from Jennifer Haigh! Was just reminded, when I rearranged my shelves, that I have this one. Think it's time to work it into the reading schedule! This was great as an audio, too! I've enjoyed a couple of Haigh's novels... really need to get to Faith soon. I would love to revisit Baker Towers in audio form. I'll need to check out audible.com, thanks for the tip on the audio! I'm so glad to hear you loved this one! I read Mrs. Kimble when it first came out and thoroughly enjoyed it, but then I missed this one and The Condition. I read Faith last year and really liked it too, so I need to go back and read the middle. I'm glad to hear I'm in for a treat! Mrs. Kimble is on my to read list. I am crossing my fingers I enjoy it, but I have a sneaking suspicion that I will. The premise of The Condition sounds really interesting as well, can't wait to pick that one up, too. Ok, I must admit I am not familiar with Ms. Haigh but after your review I am definitely going to check her out. Thanks for sharing such a lovely review and making the recommendation! Stacy, I think you will love both Baker Towers and Faith. I haven't read her other books, but I plan to read/listen to them this year. She is wonderful! This is definitely my Dad's generation. It sounds like something I'd love, so thanks for putting it on my radar screen! Baker Towers has just the right feel and flair to it, without being sappy about a vintage time that we all love to read about. It's just wonderfully crafted and I truly got swept away in it. I would recommend this to male or female readers! I read The Condition about a year and a half ago and didn't come close to loving it...or even liking it very much. But man, so many fantastic reviews of Faith since it came out, and now this one. I think it's time I give her a second chance. Oh, no! I still want to read The Condition because I have so enjoyed Faith and Baker Towers. I hope you read them also; I think you might really enjoy them! Let me know what you think if you get a chance to pick them up. I listened to the audio version of Faith and loved it. This is definitely one that I need to add to my list! Kathleen, I think you'll love Baker Towers! Brilliantly told with multiple narratives, it's just a great story. A quick read, too, because you can't really put it down once you start it! I really enjoyed FAITH when I read it last year and this one sounds fantastic as well! Thanks for being on the tour Natalie. I'm featuring your review on TLC's Facebook page today. Sounds great, thanks, Heather! Jennifer Haigh is definitely one of my favorite authors.